This June, meet Battleworld’s steadfast police force, the Thors! 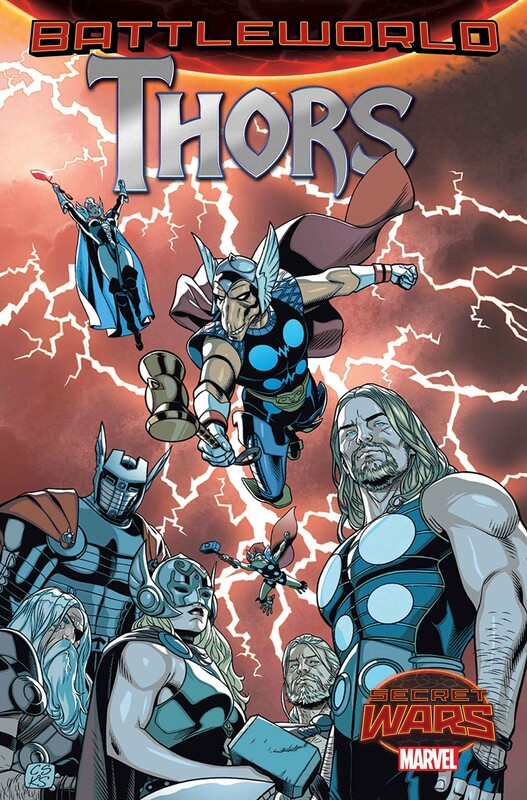 Gods of Thunder, doling out justice at the end of a hammer in THORS #1 – the brand new Secret Wars series from blockbuster writer Jason Aaron (Thor, Star Wars) and Eisner-award winning artist Chris Sprouse (Tom Strong, Multiversity)! The chaos of Secret Wars requires a different kind of lawman. Welcome to the force. Whenever there’s trouble on Battleworld, the Thors answer the call. 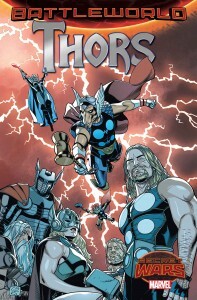 Gods of Thunder from every world, united in their quest to uphold the law. Keeping the peace, closing cases, and dispensing judgment with the crash of thunder and the crack of lightning! Yet when the Thors pick up a puzzling murder case on Battleworld, the rules change. And the entire corps is sent scrambling to find the murderer. But when some Thors begin asking the wrong questions, they’ll begin to pull at strings that could unravel the very fabric of reality! Throg the Frog of Thunder, Beta Ray Thor, Thor Stormborn and many, many more hammer wielders from across the Marvel Universe take center stage to mettle out a new kind of justice. Prepare yourselves for a hard-hitting Marvel Comics police drama the likes of which you’ve never seen before. Bring the thunder this June, as THORS #1 crashes in to comic shops and on to digital devices!